Tampa Electric’s Manatee Viewing Center at its Big Bend Power Station in Apollo Beach is known for its winter visitors, Florida manatees. When water temps drop below 68, the gentle giants migrate into TECO’s warm-water discharge canal. With only the few bouts of cold weather we’ve had in South Shore thus far, the Manatee Viewing Center’s 31st season is off to a bit of a slow start…manatee-wise, that is. But as soon as water temps dip below 68 degrees, the warm-blooded sea cows will swarm into TECO’s Big Bend Power Station’s warm water discharge canal, a state- and federally designated manatee sanctuary. Meanwhile, there’s still plenty to see and do at South Shore’s premier attraction, said Jamie Woodlee, the senior environmental technician who has been with the center for 18 years and has overseen its daily operation for the past 16. Woodlee quickly points out though that while manatees are the stars, stingrays are popular supporting actors. This season’s enhancements include a widened porch area in front of the center’s gift shop to make the area more user-friendly and improve traffic patterns; enhancing the support structure of the deck portion of the 900-foot tidal walk; adding new shell to more than 2 miles of a self-guided, looped nature trail; and adding a new cash register system in the gift shop. While none of these things may seem overly exciting, they’re all intended to improve visitor experience. In addition to its visiting Florida manatees and its cownose and southern stingrays, the 50-acre attraction at 6990 Dickman Road in Apollo Beach features a large butterfly garden; an education center filled with full-color, interactive displays; native and Florida-friendly plants garden; 40-foot observation tower providing a panoramic view of Tampa Bay; snack bar; souvenir photo stations; picnic area; and three different natural habitats for people to explore. 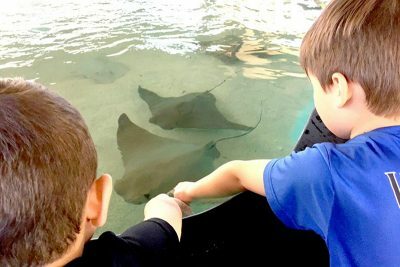 While manatees are the star at the Manatee Viewing Center, its cownose and southern stingrays are popular supporting actors. The touch tank is a partnership between the center and the Florida Aquarium. The center is open annually from Nov. 1 through April 15. Its hours are 10 a.m. to 5 p.m. daily, except for Thanksgiving, Christmas and Easter. It closes at 3 p.m. Christmas eve. Admission is free. 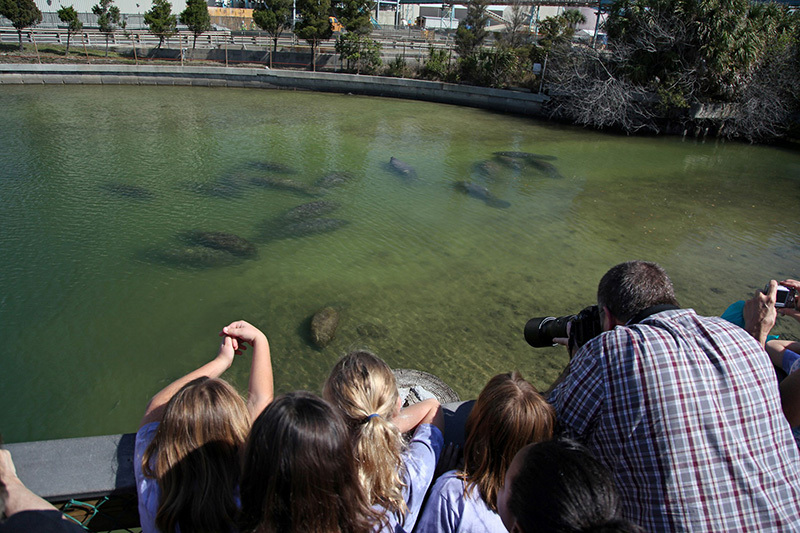 At the height of the season, hundreds of manatees can be seen on any given day. 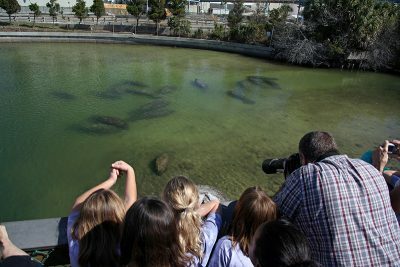 During the 2016-2017 season, the Manatee Viewing Center’s attendance was 384,000 and a similar, if not larger crowd is expected the 2017-2018 season. For more information, call 813-228-4289 or visit www.tampaelectric.com/manatee, where you can learn all about Florida manatees, which remain a threatened species.